Sitan Gym NY sits nestled cozily on a block full of shops in Astoria, Queens. On one side of the studio is a 99 cents store - the kind of cornerstone you’d find in New York City, with brooms and plastic flowers displayed outside. On the other side is a Middle Eastern restaurant, with meals so loosely defined as “Middle Eastern” that anyone from Iranian to Turkish could walk in and find a dish they often ate at their grandmother’s table. Even as gyms go in New York, this one isn’t very large, but on a humid day in May it is still packed with people. Neighbors and shop owners stop by to watch the students running, hitting bags, and holding pads for one another. They nod at those they recognize and wave their hellos to owner and head instructor Aziz Nabih. He is working solely with one fighter at the moment: a tired, shirtless, and sweaty James “Guch” Guccione. Guccione is mid-way through one of his many training sessions of the day, as he prepares to fight on Friday Night Fights’ May 19th card. His opponent isn’t a foe, but a friend, Chris Tapia of Weapons 9. “Guch” says the two have been planning to fight for some time, but it never seemed to work out. His game plan for that evening is to fight and then likely catch a drink with his opponent afterwards. 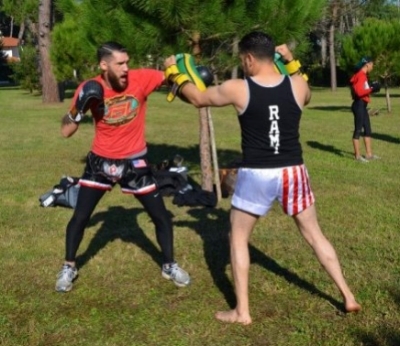 “No one is really enemies in the Muay Thai community. Most of us are friends–very good friends. If you have enemies in this sport, then you’re doing it wrong,” he says. James would know that better than anyone. 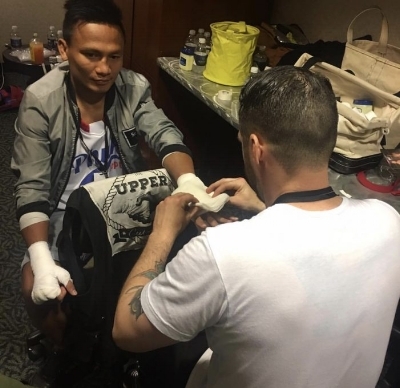 When he’s not fighting, or working at ConEd as a High Voltage mechanic, a job that can have him working anywhere from 8 to 12 hours at a time at any time of the day, he works as a cutman for his business The Upper Cutmen. This Friday Night Fights card, he’s actually fighting, but most times he’s wrapping the fighter’s hands and dutifully sitting in a corner during the bouts, next to a referee and the doctor. As soon as any hint of blood appears on a competitor, Guccione is in the corner with their coaches, working his magic to make it disappear. Sometimes a skilled hand closing a cut is the very thing that could prevent the fight from being called, allowing the fighter another opportunity to take home a win. Something that began as more of a hobby has become a full-blown profession. 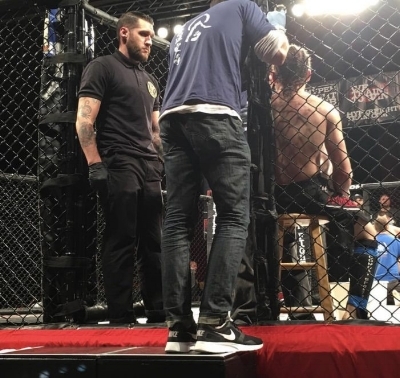 Guccione recently traveled to Connecticut to be the cutman for Lion Fight 36, wrapping champion Muay Thai fighter Lerdsila Chumpairtour in the process. It was just another weekend for Guch however, as he is in demand for nearly every promotion in the Tri-State area. Well-known in the Muay Thai and MMA scene, as soon as James enters an event, he is greeted by nearly every person in the venue. Guccione is an unmistakable presence at events, with his trademark beard, fedora, and black vest. His clothes come from the store he runs with his wife Ana, called The Stonework. It is a hop, skip, and a jump from Sitan, just up the street. Much of the embroidery on items at their shop is done by Ana’s hand, as well as the decisions for the carefully curated clothing and art selections. The store is filled with vintage and vintage-styled items, from prints hand-drawn by a tattoo artist to denim jackets and rockabilly dresses. If you were meeting him for the first time, you would be convinced James was the ultimate self-made man. 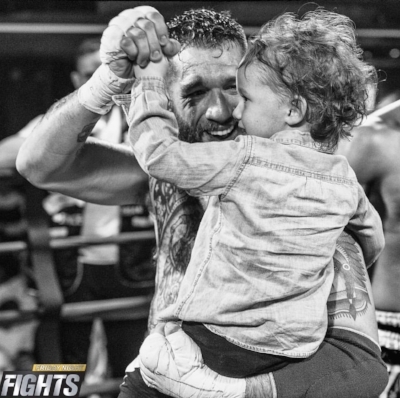 A beautiful wife and daughter, a career that he loves, successful businesses, and a fight record that many would have difficulty obtaining. His life didn’t come easily however–it’s been a multitude of things that have led him here. 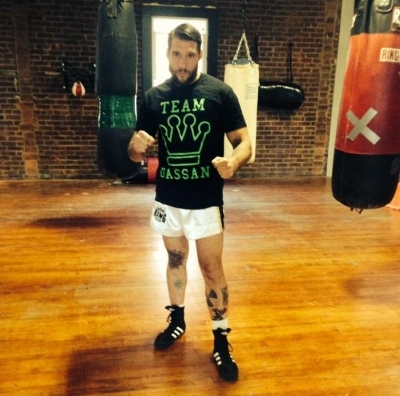 Although the Yonkers-born Guccione initially stayed close to home and trained at the Westchester Fight Club, he eventually found himself at Sitan Gym. Since he was 18, he had been working for ConEd and would drive down to Astoria almost daily. A friend from a bagel shop up the street convinced him to try some classes with Aziz, as James had already been working with another well-known Sitan trainer, Sean Hinds. He made it to Nationals and then eventually Italy for the WKAs, and upon returning home, decided that Sitan was where he wanted to be. Fighting since 2009, James has a 12-6 record now and doesn’t reflect too much on who he was before he started Muay Thai. Back at the gym, Guch is in a corner of the mat while the rest of the team is practicing knees on heavy bags. He is pushed against the mirror and is forced to redo the same kicks over and over again until Aziz thinks they are perfect. As instructor Joel teaches the class, he occasionally glances over to see what Guch is doing now and offers a few words of encouragement while the students work on their technique. “I see the changes in James. A lot of people have this story as well–they have been able to change their lives from it. He has grown as a man completely since he first walked through those doors,” Aziz says. Known as a man of few words, Nabih is concise and straight to the point. He’s one of the most respected coaches in the United States, training fighters such as Cyrus Washington and Kem Sitsongpeenong. The Moroccan-born Nabih had began training at the age of 10 until he moved to the States in 1993 from Amsterdam. He eventually took over a Tae Kwon Do studio and made his priority on building his team instead of his profits. As James works with Aziz, it’s a surprising contrast between the two men that could only appear in a martial arts academy. Nabih is completely bedecked in orange: an orange shirt, orange shorts, orange leggings, and an orange longsleeve. He has on an orange belly pad, thigh pad, and Thai pads, and appears as a very serious tiger looking to protect his cubs. Guccione on the other hand, is the complete opposite. His Thai shorts are rolled up, his stomach and chest tattoos with the moniker “GUCH” and a man riding a bull are on full display. He’s red-faced and sweaty, but still smiling even while coaches Aziz and Sean shout instructions at him. Guch is tired after working all night for ConEd, but is pushing through. 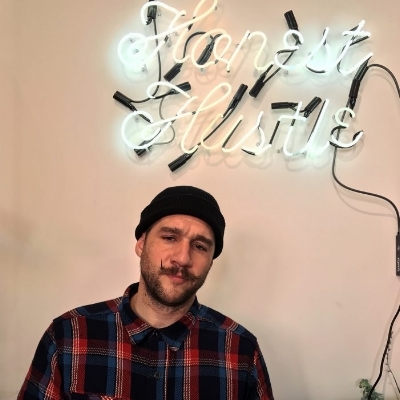 Soft-spoken but articulate and friendly, Joel sits behind the desk and helps run the gym. He is Aziz’s main man and can be counted to do anything that is needed. A multi-tasker, Estevez simultaneously teaches a class while ensuring that guests that come through the door are attended to. As James is checking Aziz’s kicks to his leg, a bumblebee tattoo on his calf is prominent. A friend did for him when he was only 14–it’s green because they had no other ink to use. Despite the many more detailed tattoos he has gotten since that time, he has chosen not to cover it up or even fill it in. It is almost as if the bee is a reminder of his youth and where he came from, even as his fight camp is a symbol of where he is going. Someone new has started today at Sitan and while he isn’t in the usual Muay Thai attire, everyone is helping him. 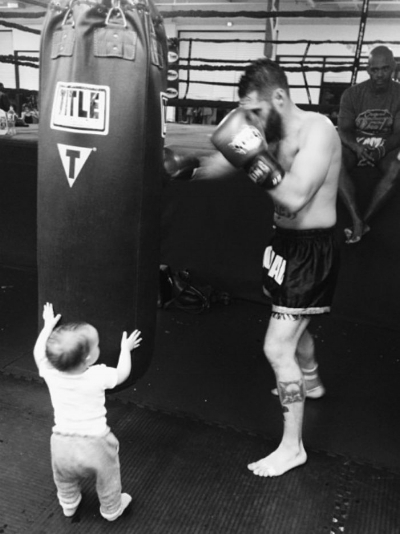 Joel teaches him how to hold his arms up properly to defend his face, and patiently explains what a jab and a cross is. Between rounds, Guccione walks over and claps the new student on the back, and asks him how he likes training so far. As class ends, Aziz takes a few minutes to talk to him and advocates for his return. No one goes unnoticed at the gym. Training has finished and the three men have cleaned up. They sit on the chairs that are at the front of the academy and talk about their plans for the rest of the day. Aziz is going to go for a run at the same time as Joel, but first he needs Joel to run to the bank for him. James has different plans. Always on the go, he has a meeting to head to and then will go spend time with his daughter as his wife goes to work. If either of them are running late, they can call someone from the gym to open the store for them. It’s more than just a community of trust, it is as Aziz says, “a family”. 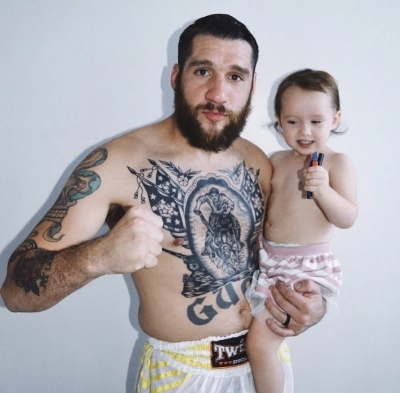 The family continues to grow, as James’ daughter Story has now started doing Muay Thai at nearly four years old. Aziz himself held pads for her, as James watched proudly. It’s only midday now, but James has been up since 7 pm the night before. He doesn’t have time to take a break until later, but he is content with what he has to do.